Obsessed with old movie cameras, clocks and other time-related mechanizations; I set out to combine the moving image with sculpture. In this quest, I created a device that I named “intertrope” (inter=between, trope=turn). 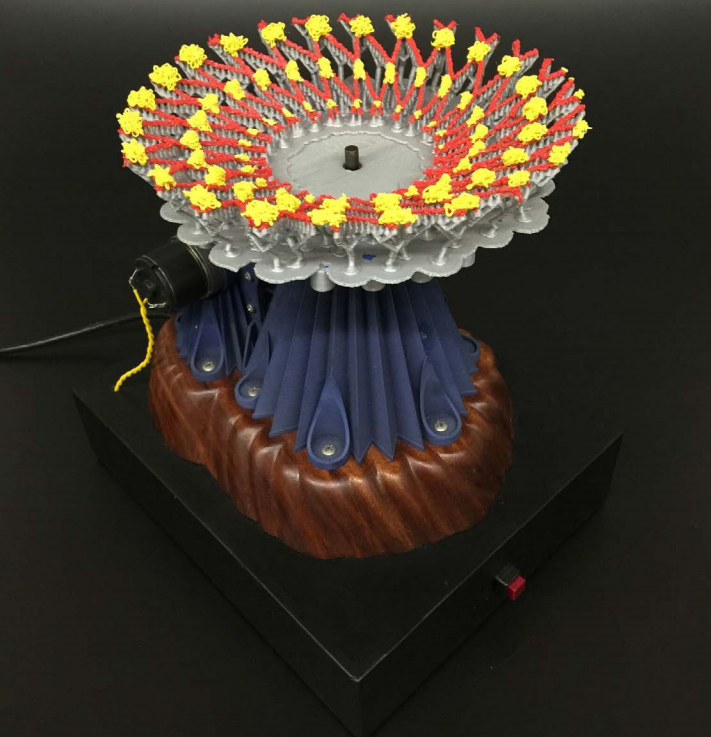 The intertrope is a kinetic sculpture that resembles the classic parlor toy called the “zoetrope” yet is an entirely new, contemporary animation device. It has the ability to animate 2D and 3D objects without any need for special lighting, mirrors, shutters or other viewing aids. The Intertrope Base Unit is an exploration of the device as an entirely mechanical unit. It is akin to a record player, capable of playing proprietary animation “records” such as “experimental Animation #13” which is one of the many 3-Dimensional animations that I have designed and constructed for the device. Ryan Buyssens is an Assistant Professor of Sculpture and Applied Design at the University of Central Florida. Born and raised near Detroit, MI; an environment that imparted a rich, lifelong influence from the automotive industry’s mechanized culture, he is an artist in the broadest sense of the word. Ryan expresses his ideas through countless media. Preferring to explore the “what if” in the evolution of technology, he seeks out a departure from the logical path of invention and uses it as a branch that sprouts new possibilities; his work becomes a comment on logic and progress.Ryan received his MFA from Cranbrook Academy of Art in 2004 and the NC Arts Fellowship for 2012/13. Ryan’s explorations are aimed toward exploiting interactivity of objects and environments in order to create new experiences for participants. He also has a keen interest in kinematics and seeks to understand and replicate natural motions by creating the complex kinetic systems used in his art. Ryan’s work has been exhibited internationally – including NYC, London, Dubai and the Louvre in Paris.